To many music lovers in the UK the penultimate weekend in June means a trip to the ultra-cool mudfest that is Glastonbury, but for me it’s a trip across the Channel to some fields near the small town of Dessel, near Antwerp in Belgium, for the three day rock and metal extravaganza that is the Graspop Metal Meeting. Like Germany’s Wacken festival in August, this has become an annual fixture in my calendar as, whilst it might lack a little of the atmosphere and sense of camaraderie you get at Wacken, the line-up is always quality, with a real mix of genres spanning the metal spectrum; from old-school to nu, prog to death metal, classic rock to raging metal- and hard-core, there really is something for every fan of the heavy stuff here. Also, whilst its undoubtedly a fairly corporate affair, the mix of genres on show along with the relatively relaxed security, reasonable size (at 30,000 people its enough for a great crowd but not too much that it ever feels uncomfortably packed) and – perhaps most importantly! – clean toilets mean it’s a preferable alternative to the nearest UK equivalent, Download. The weather was actually pretty decent for the queue to get in to the campsite and the all important putting-up-the-tent ritual, and held up for much of the day. Kicking proceedings off were re-activated British rockers Fastway, named for band leader (and ex-Motorhead guitarist) ‘Fast’ Eddie Clarke, and certainly not for the music, which was mid-paced hard rock; whilst hardly much to get excited about at least it got things off to a reasonable start. Whilst I don’t really agree with Thin Lizzy calling themselves Thin Lizzy these days (it simply isn’t without the late Phil Lynott) it was a pity they cancelled at the last minute, as the sing-along nature of their music would have kicked things off properly on the main stage. Instead I grabbed a few minutes of power metaller’s Sabaton’s (fairly standard issue) set, before heading to the metal dome to catch twenty minutes-worth of Dutch post-metallers’ Textures’ show. An intriguing mix of Isis, Cult of Luna and Mastodon, Textures put on an impressive and assured stage display that made me pleased with my decision to catch them when they toured the UK the following week. The first set which I watched the whole way through was that of Finnish act Amorphis, a band I’ve long wanted to see live. Having started out as a folk (and folk-lore) inspired black metal outfit (their 1994 effort Tales From A Thousand Lakes is considered something of a classic of the BM genre), subsequent efforts saw them move much more towards a polished, streamlined (if still vaguely gothic) rock sound, which culminated in 2000’s Am Universum, parts of which could even be mistaken for U2! Since then, they’ve gravitated towards a sound which embraces both these elements, and produced one of their best works in 2005’s Eclipse, which formed the backbone of tonight’s set. Songs like The Smoke and House Of Sleep blend gothic-tinged riffs, Finnish folk influences and anthemic choruses to great effect, and are mixed in with some quality picks from their more recent back catalogue. Relatively new vocalist Tomi Joutsen, with his striking dreadlocks and armed with a vintage-looking radio mic, puts in a fine performance, as do the rest of the band, and not even a slightly sub-par sound can dent a quality show that certainly had me anticipating forthcoming album Silent Waters with some relish. Thankfully next up in one of the Marquees was Pain Of Salvation, who produced a wired, energetic performance that was almost the polar opposite of Within Temptation’s autopilot affair. Kicking in with the irresistible thick riff of Scarsick, it’s immediately apparent that main-man Daniel Gildenlow is in fine and feisty form here – he may be dressed in plain white t-shirt and blue jeans (and even has a pretty anonymous short haircut these days) but he’s still a very charismatic frontman, constantly gesticulating, jumping around and generally emoting, making him the focal point of the band’s performance. The other tracks aired from Scarsick were perhaps not the most obvious choices – America and Disco Queen (and full credit for having the balls to play the latter at a metal festival!) – but they came over well, although for me the highlights were the plundering of the back catalogue for emotional renditions of Ashes and Undertow (the latter seemed slower and even more wrenching than the studio version), the anthemic Used and the spiralling riffs of set closer Inside. A high quality performance, much appreciated by the sizeable crowd. Over on the main stage, Chris Cornell seemed on paper a rather strange choice, especially as his recent solo album is reportedly a pretty mellow affair. Yet it was the back-catalogues of previous bands Audioslave and (in particular) Soundgarden that he raided for the bulk of the set – and as a fan back in the day of the latter, it was great to hear the likes of Rusty Cage, Spoonman and, especially, the wonderful Black Hole Sun, belted out, along with the recent theme tune for the James Bond film Casino Royale, You Know My Name. Complete with a relaxed and assured stage presence, Cornell succeeded in winning quite a few of the crowd over. Over to Marquee 2 next for a burst of guitar god Joe Satriani. Whilst blessed with sublime instrumental skills, Satriani has always struck me as one of the best of the virtuoso’s at combining dazzling technique with melody, therefore making his music accessible to the ‘ordinary’ music fan rather than just tech-heads. Satch’s most famous album is probably still Surfing With The Alien; nowadays it has to be said he resembles a comic book version of one, with his shiny bald head and wrap-around shades. Tunes from said opus were probably the highlight of his set, with some of the latter-day material coming across as rather less inspired. Closing out proceedings on the main stage were hard rock survivors Aerosmith. The band made a smart move by opening with the can’t-fail party rock anthem Love In An Elevator, which immediately got the crowd going. Its rather disarming to note that both vocalist Steven Tyler and guitarist Joe Perry don’t appear to have aged a day since their ‘comeback’ in the mid-80’s – I’d like to believe this was due purely to a healthy lifestyle, but suspect some sort of chemicals (although not the kinds they used to inject..) play a part… anyway, they still have all the moves and come across every inch as showmen. Song-wise, it’s the expected mix of seventies classics (Same Old Song And Dance, Toys In The Attic), crisp late 80’s/ early 90’s hard rock anthems (Rag Doll, Livin’ On The Edge) and – unfortunately from my perspective – the big commercial ballads they seem to be known for in this day and age (Cryin’, I Don’t Want To Miss A Thing). Interspersed with these were some bluesy jams based around the recent Honkin’ On Bobo blues covers album, which saw things get a bit ragged and perhaps the set lost a bit of momentum in its mid section. Generally speaking a good show however and ending with Walk This Way meant most went away with a smile on their face. By this time it was gone one in the morning, yet this wasn’t the end of the night’s live entertainment; this year punters had the choice of German power metal legends Blind Guardian or Swedish symphonic masters Therion. I chose to watch the latter, who put on a strong show despite a rather indistinct sound. Instead of having a full choir on stage as they did prior to this year’s Gothic Kaballah album and tour, they now boast two male (metal) vocalists and two female (more operatic) vocalists – guitarist Christopher Johnssen no longer does the growling-style vocals he was once famous for, a fact that is probably a relief to the more faint-hearted fans! With an elaborate stage set (giant flaming torches, vocalists standing in alcoves behind giant railings until their lead spot arrives) and a darkly gothic dress sense, the band make a striking visual as well as audio presence. Playing the pick of the new album (standouts being Sons Of The Staves Of Time and The Perennial Sofia) as well as a smattering of tracks from their more recent back catalogue, this was a fine, if somewhat exhausting, way to end what had been a great first day of the festival. Whilst Saturday boasted some of the most enticing main-stage acts later in the day, the quality of the supporting acts (as far as my music tastes go) was not so high as the previous day. The first band I caught were Norwegian femme-metaller’s Sirenia – two songs in I had had enough, the band’s material was rather on the poppy side of the genre for my liking and they really lack any sort of stage presence. A complete contrast to this manufactured blandness were reactivated technical/ progressive death metallers Atheist, who were playing what was purported to be one of their last reunion shows here. Readers of my review of the reissue of their classic Unquestionable Presence will know I hold this band in high regard, and this show (unlike a rather patchy one at last year’s Wacken) thankfully lived up to expectations. It helped that the band were in the Marquee rather than outside subject to the elements, as you need to hear all the intricacies. Playing a good mix of tracks including a couple each from the more straightforward death metal of debut Piece of Time and third (and final) album, the more jazz/ ethnic leaning Elements, for me it’s the tracks from the aforementioned Unquestionable Presence which come over best, the likes of …And The Psychic Saw, Retribution and the incredibly twisted jazz-metal mash-up of Mother Man getting the full treatment from the now five-piece band. Frontman Kelly Schaeffer is now free of the guitar and makes the most of the freedom, cutting an energetic figure on stage, but for me its bassist Tony Choy who steals the show, making it seem so easy to play such breathtakingly complex bass lines. Great stuff and a fitting finale if that’s the last we see of them. Whilst not quite in Atheist’s league, over in the Metal Dome French outfit Scarve played a decent set, their menacing yet complex and, at times, melodic technical death metal coming over well. Come 6.30 and it was time to head over to the main stage for Heaven & Hell – and as if on queue the heaven’s opened! Yet despite getting thoroughly soaked, this could not stop my enjoyment of what turned out to be one of the best sets of the festival. As most people will surely know by now, ‘Heaven & Hell’ is the moniker under which Ronnie James Dio, Geezer Butler, Tony Iommi and Vinnie Appice are currently touring under – the band who as Black Sabbath released the classic’s Heaven and Hell and Mob Rules back in the early 80’s – and also the slightly less classic Dehumanizer in 1992. From the opening notes of The Mob Rules itself, its immediately clear that the band are on superb form, with Iommi’s trademark guitar riffs ringing loud and clear, and Dio – despite surely pushing 70 by now – neither looking, nor crucially, sounding, any different than in his late 70’s/ early 80’s ‘heyday’. From thereon in its metal nirvana all the way – other Mob Rules tracks such as Falling Off The Edge Of The World and Voodoo, plus the surprisingly heavy I (from Dehumanizer) all hit the spot, yet it had to be the songs from the legendary (now self-titled!) debut which really turned the concert from a very good to a great one, with rousing renditions of Die Young, Children Of The Sea, Neon Knights and of course, an extended Heaven And Hell, with Dio giving over the mic for some vociferous crowd sing-alongs. Classic metal doesn’t get much better than this. After a trip back to the tent for a short break (and a change into some dry clothes!) its off back to the festival arena for tonight’s headliners, Iron Maiden. Now, whilst Maiden may have had some dips in terms of creativity back in the early to late nineties, one thing they’ve never been is anything less than a stellar live band, always giving 100% on stage and matching their energy with fine musicianship and stellar stage sets. Since Bruce Dickinson returned to the band in 1999, they have come up with some of the best gigs I’ve seen this decade – and that’s out of hundred’s I’ve attended. With a fine new(ish) album out in A Matter Of Life And Death, its clear the band are still on good form musically so I didn’t expect tonight to disappoint – and nor did it. For the autumn tour in support of AMOLAD Maiden played the album in its entirety; obviously this isn’t necessarily appropriate for the festival circuit so instead the band have come up with a compromise – the tour is being touted as ‘A Matter Of The Beast’, concentrating on songs from AMOLAD as well as their landmark A Number Of The Beast album, amazingly (and somewhat frighteningly) now 25 years old., with a smattering of the sing-a-long classics without which no Maiden show would be complete. Bursting onto the stage to the opening notes of Different World, Maiden are a bundle of energy from the off, bassist Steve Harris legging it around the stage and periodically planting feet on monitors as he mouthed the words, guitarist Janick Gers constantly whirling his guitar around his head (and not actually playing it that much- although I guess that’s the advantage of having a three man guitar attack!) and Bruce Dickinson in his usual strident (if slightly bad-tempered) mode, his air-raid siren-like voice still easily up to the task. The new material translates very well to the stage, with the pick of the five tracks aired being the rousing Brighter Than A Thousand Suns and The Reincarnation Of Benjamin Breeg, with its cracking central riff. Of the Number … tracks, well the band can hardly fail with perennial crowd pleasers like Run To The Hills and Hallowed Be Thy Name, although its nice to see one of the less heralded tracks from the album, Children Of The Damned, get a rare airing. Of the other songs aired, well, it’s the usual suspects really, with the likes of The Trooper, The Evil That Men Do, Two Minutes To Midnight and the closing Iron Maiden itself all going across well with the (easily biggest of the weekend) assembled crowd. Personally speaking, I wish they’d have left out the (in my opinion) fairly average Fear Of The Dark, but again its clearly a fan favourite. Its also a pity that FOTD is (bar the new songs) the only post-1988 song aired – I hope that some of the fine tracks from Brave New World and Dance Of Death haven’t been permanently laid to rest so soon. Overall though, another great show from Maiden. Topping it off is the appearance of their gruesome mascot Eddie in giant form, here variously seated in a tank, appearing as ‘the beast’ for A Number Of The Beast, and dressed as a soldier complete with giant gun, which Janick Gers has fun grappling with (oo-er!). Its these high standard production values which help put Maiden at the top of the heap as far as heavy metal live shows are concerned. The huge crowd surge to leave the venue may have been a pain at the time (and a test for the festival organiser’s security resources) but was testament to the fact that pretty much everyone on the site had watched the show and stayed for every last minute. Maiden continue to march on – and I’m certainly looking forward to the celebrations of the Powerslave era slated for next summer. Sunday was the opposite of Saturday, in that most of the band’s I was looking forward to were in the marquees, as opposed to on the main stage. 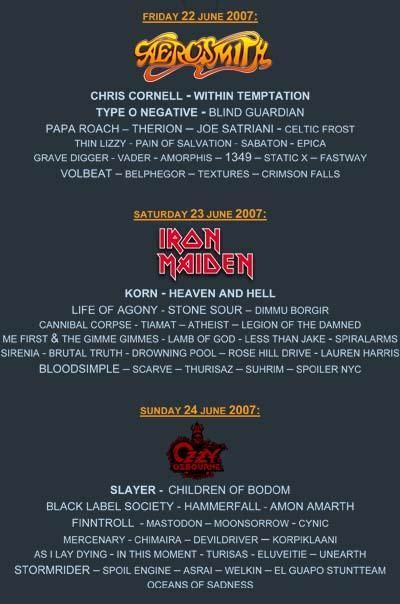 In fact, that could be narrowed to ‘in Marquee 2’ because the Marquee 1 was exclusively given over to Scandinavian (and in fact mostly Finnish) ‘battle’/ ‘folk’/ ‘Viking’/ ‘oompah’ whatever-you-want-to-call-it metal. Whilst this style (resplendent with fans in plastic Viking helmets and waving (hopefully plastic!) swords and axes around) is certainly flavour of the month, its in general not my favourite style of music, and thus I steadfastly ignored the ‘delights’ of Korpliklaani and Finntroll. I did however catch some of Turisas’s set – clad in furs and streaked with blood-coloured face paint, they put on an exuberant show, and in the likes of As Torches Rise and Battle Metal have some of the more rousing, anthemic tunes in the genre. Guaranteed to bring a smile to all but the most dour metaller’s face. I also caught a few minutes of Moonsorrow’s act – this long-running Finnish act are a much more serious proposition than many of the other acts playing the marquee today, and are best described as a mix of progressive, black and traditional Scandinavian folk. The band’s latest album, V : Havitetty impressed me greatly, but they seemed to be playing earlier, more straightforward black metal material today – anyway clashes meant I wasn’t able to fully immerse myself in their sound; luckily they’re playing Wacken in August and I’ll get the chance to catch a full set then. Over in Marquee 2, I stumbled across Mercenary’s set almost by accident. These Danish metallers, who play what I guess you could call a mix of progressive and melodic death metal, left me completely cold when I last saw them (supporting King Diamond), but today, whether due to a reinvigorated performance or better sound – probably both – they were far more pleasing to the ear. Armed with a good stage presence and a well-balanced mix of melody and force, this was a fine set, topped off with a great rendition of what is still probably their strongest song, the catchy Eleven Dreams. As I had reviewed their A Touch In The Dark album a few year’s back, I felt compelled to at least check out Dutch gothsters Asrai in the Metal Dome. It was a curtailed visit however, as their songs come over as even more flat and samey live than on record. Not content with having one re-activated cult technical/ progressive/ death metal band on the bill with Atheist, the organisers had also got hold of legendary Florida outfit Cynic. This was a surprising reformation I must admit – mainly because the main (and only original) band members Paul Masvidal (guitar/ vocals) and Sean Reinert (drums) have only just released the new album by their melodic rock outfit Aeon Spoke, and I would have thought they’d be off promoting that rather than playing material from a fourteen year old album that is musically light years away from where their heads appear to be right now. Not that I was complaining though – it may have been released in 1993 but Cynic’s sole release Focus remains as fresh, innovative and relevant as it was then. Always an acquired taste, I was surprised to see the Marquee rammed – but soon found out that this was because of wimpy metallers sheltering from the rain – as soon as it cleared up they fled, leaving a smaller but dedicated army of fans to cheer the band on. Given that Focus is only 35 minutes long, and that Cynic had a 40 or so minute set, its no surprise that they play the whole of the album plus an intriguing ‘work in progress’ that holds the promise of some recording activity in the future. Whilst the band are hardly the most animated on stage, its still great to hear gems such as Veil Of Maya and Celestial Voyage played live. I should state that the band made judicious use of samples – both for some of the keyboard sounds and for the death metal vocals – but this takes nothing away from the playing of the four musicians, with Masvidal’s superb (and seemingly effortless) performance on guitar standing out – his vocals have also improved substantially since 1993! Whilst as I said Cynic are hardly the most visually captivating band of the day, the music did the talking, and it was great to have the opportunity to see this legendary outfit in the live arena. Following such intensity, it was time for a more light-hearted slice of metal over on the main stage – yes, those kings of Swedish power metal Hammerfall were in the house. Sadly minus the iceberg props they had on stage the last time I saw them, in all other respects this could be the same show – different songs maybe, but Hammerfall aren’t really the most progressive of bands, to put it mildly. Good fun fists-in-the-air stuff that’s perfect for an afternoon metal festival crowd. Time for a bit of a break before catching Slayer on the main stage. Not exactly a DPRP type band I would imagine, so I won’t go into their set – suffice to say it was a pretty typical (and enjoyable) Slayer performance, although they need to start varying their setlist a little more to avoid becoming stale. Although I’d seen Mastodon a number of times, I hadn’t caught them since the release of their third (and most ambitious yet) release, Blood Mountain, and was keen to see how the new material came over live. Now Mastodon are a band who really need a good sound in order for the complex material to come over properly, and pleasingly got one here. Together with a fired-up performance by all four members (and bassist/ vocalist Troy Sanders in particular) this meant that they produced a gig as good as any I’ve seen by them. New material such as The Wolf Is Loose and Capillarian Crest impressed and blended seamlessly with songs from Leviathan, which forms the backbone of the set, the catchy riffing and thunderous beats of Blood And Thunder and Iron Tusk getting every head in the place banging – Mastodon being one of those rare bands that can move the mind and body at the same time! Diehard fans also delighted in an airing of the raw, bottom-heavy dirge that is March Of The Fire Ants, a cut from their debut album Remission which still makes the requisite impact. Its heartening to see the Marquee is almost twice as full as the last time I saw the band here in 2005 – Mastodon seem to be justifying their major label, Warners, faith in them by pulling in new fans whilst stretching their sound even further from the mainstream. A class show from a class act.